At the funeral service in December the Rev Penny Yeadon told those who did get there that the core of Mrs Shuttleworth’s life had been her faith in Jesus. This has been evident in her calling to be a nurse in inner city hospitals, in the way she assisted at her husband’s medical practice, the communities she lived in, and as a homemaker. She was born at Whitley Bay in Tyneside in 1917 but, as her son Keith explained, the family moved to Rothbury in Northumberland while she was still young because her father had to take early retirement from the ship yards due to ill health. She enjoyed the open countryside as well as taking part in sports and the Guiding movement. During the war, after qualifying as a nurse, she transferred to the Liverpool Royal Hospital where she met Dr Bill Shuttleworth. He was born in Coventry and grew up in Wales. “The romance soon blossomed completely contrary to hospital regulations which would not countenance such a scandal,” said Mr Shuttleworth. They were married at Rothbury in 1943 and not long after that Dr Shuttleworth joined the RAMC. By 1954 she also had four sons to care for but all that did not stop her having her own interests. She joined the Women’s Institute and the St John’s Ambulance as well as helping with Meals on Wheels. But her main interest was the church at which she was a Sunday school teacher and a member of the Mothers’ Union and the choir. She also occasionally played the organ. Dr Shuttleworth’s annual two weeks leave gave them the opportunity to take caravan holidays in Scotland, Ireland and Scandinavia – and also in Walden near Leyburn. This led to their buying a house in West Burton in the 1960s and to which they retired in 1975. They joined Aysgarth church and became choir members. Mrs Shuttleworth was the choir leader for 16 years and especially encouraged the junior members. She was the church organist for a few years after Madge Blades retired. 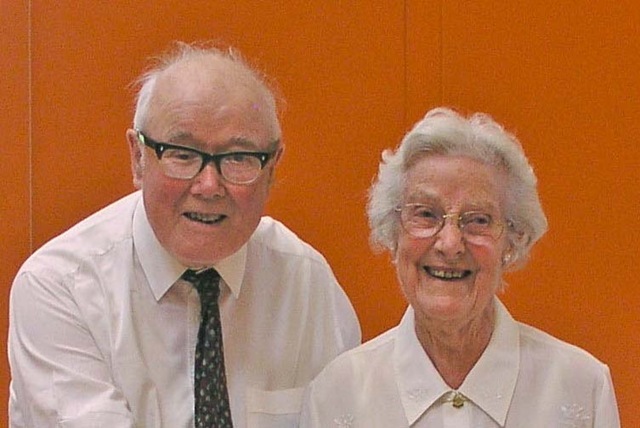 Retirement provided them with an opportunity to expand their love of classical music by learning to play the violin and cello and they joined the Wensleydale Philarmonic Orchestra. They sang with Aysgarth Choral Society for many years and were instrumental in the formation of a local recorded music club. Her continuing love of sport led to her becoming a lady member of the Yorkshire County Cricket Club, and to buying a wide-screen plasma TV recently so she could enjoy watching cricket, tennis and snooker matches. Mr Shuttleworth thanked all the neighbours and friends who had helped his parents in the past few years, and had supported his mother after Dr Shuttleworth died in 2009. He also thanked those who had cleared the driveway to the church on the day of the funeral. EXCERPTS FROM THE REV SUE WHITEHOUSE’S ADDRESS ON MAY 15: She began by reading the pilgrim journey of the Church as described in a prayer by George Appleton, one time Bishop of Jerusalem. “For over 90 years the church’s (pilgrim) journey was also Eileen’s, and for a good part of that time within the fellowship of St Andrew’s church. “The early Christians devoted themselves to the Apostles’ teaching and fellowship, to the breaking of bread and prayers. Eileen’s own spirituality was sustained by receiving communion and by her daily prayers and Bible reading. 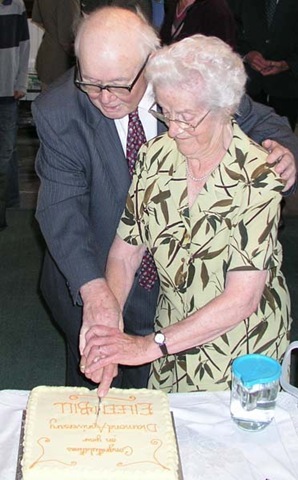 Gathering together for worship was important to her – she was faithful in her attendance at Sunday and weekday services. There was a steely determination about Eileen. It was because of Eileen that the midnight Christmas communion service about 12 years ago actually took place. It was a night of dreadful storms. She and Bill had had to negotiate a fallen tree on their way out of West Burton. They arrived to find no electricity at church. Eileen made her way in the pitch black to the vestry to find some candles. When I arrived from Redmire the church was in candlelight and ready for what was to be a memorable service. “Hospitality – reflecting God’s welcome to each of us – has always been a hallmark of Christianity. Eileen and Bill’s home was a place of welcome. Meals with friends; larger gatherings to celebrate important birthdays or anniversaries; choir parties – especially enjoyed by the younger members with their good old-fashioned party games; and shared meals for Christmas and Easter. It was generous and sensitive hospitality. Dr Shuttleworth told all those who attended the celebration at West Burton village hall that so much in his life, including his 25 years as a GP in Barnard Castle, would not have been possible without Eileen. Along with raising their four sons (Keith, Hugh, Philip and Paul) she had been the general practice nurse, receptionist and dispenser at that surgery. She was also the nursing officer with the local St John’s Ambulance Brigade for many years. In 1945 he joined the Royal Army Medical Corp for two years seeing his wife only occasionally in her small cottage near Rothbury. “There was no electricity. There were oil lamps and an outside toilet,” she recalled. Her father sent in a snow plough to get her out during the winter of 1947, just two weeks before her second son was born. So she was very pleased when Captain Shuttleworth was demobbed. It was in 1965 that they bought a holiday home in West Burton and began singing with Aysgarth church choir. By the time they retired and moved to West Burton they had been singing with the church choir in Witton Park for 25 years. They said their love of classical music and working together had kept them close. “It has been a very satisfying and happy marriage,” commented Mrs Shuttleworth. Her husband added: “We just hit it off together and we helped one another. We needed each other.” Both had a deep Christian faith but in all their years of attending church services they rarely sat together because of their choir duties. They notched up another 25 years of choir singing with Aysgarth church choir!